What do you carry in your pen wrap? Could be pens ... but could be your flash drive, mini-ruler, makeup brush -- or even a cigar. Browse the pen wraps, and I'm sure you can think of more! My wraps are handcrafted and do not look or feel "manufactured perfect." However, if you appreciate unique and useful items, I believe you will find them satisfactory. Want another opinion? 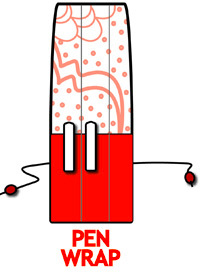 Try Jeff Abbott's review of EXB pen wraps at The Pen Addict blog. I know that people have different tastes and uses for this kind of product. For excellent pen wraps of various other designs, be sure to visit JetPens and Nock Co. You can check out independent producers on the Fountain Pen Network, Etsy and Instagram as well. Please note that I am a hobby craftsperson and do not always have time to sew. My stock tends to sell out quickly, sometimes within hours of going up on the site. So -- when will there be new stock?. Follow me on Instagram where I am @exbpens. Just before I post new stock I always put up a photo and that's the signal! Second note: I cannot accept any more special orders for awhile. My progress on them is just too slow and the list I have now will take months as it is. Are you a Paypal user and do not want to use a credit card? Please write me from the Contact page to see whether I can snag the pen wrap you want off the site in time for you to pay via Paypal. All the images used in this template are the property of EXB and used with permission. What do you carry in your pen wrap? Could be pens ... but could be your flash drive, mini-ruler, makeup brush -- or even a cigar. Browse the pen wraps, and I'm sure you can think of more! My wraps are handcrafted and do not look or feel "manufactured perfect." However, if you appreciate unique and useful items, I believe you will find them satisfactory. I know that people have different tastes and uses for this kind of product. For excellent pen wraps of various other designs, be sure to visit JetPens and The Fountain Pen Network and Nock Co.